Countless World War II memoirs have been written, but few offer the German civilian perspective. Brigitte Z. Yearman's evocative survival memoir provides that fresh voice. Young Brigitte knows nothing of the politics of war. All she knows is that the conflict has separated her from her family and taken her father away to fight. When her hometown becomes a bombing target, Brigitte is transported to the rural town of Seidel. Her foster family openly opposes the Nazi regime, but when the war ends, that isn't enough to save them from new troubles brought by Allied troops. Russian soldiers and Polish settlers occupy Seidel, and Brigitte and her foster family are forced to leave. As refugees they embark on a harrowing life-or-death journey to safety in West Germany. Brigitte is determined to find and restore whatever is left of her biological family. That quest will forever change her understanding of home, peace, and personal identity. This tale of courage and compassion tells a poignant story about a resilient and resourceful girl coming of age during extremely troubled times. Along the way, she must learn to balance her longing for restoration with an acknowledgment that some wounds never heal. As a German child, Brigitte Yearman survived World War II, Russian military occupation, the refugee experience, and harsh reconstruction years. 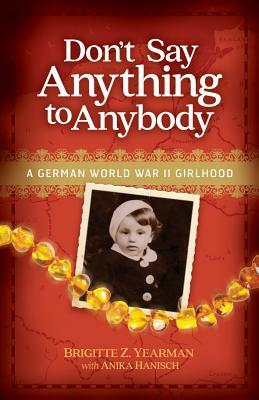 Her memoir recounts her journey of survival and how she came to learn about the Holocaust and the frightening realities in her country's recent history. Later as a young woman, Brigitte met and married an American soldier. They moved to the United States where they raised four daughters. After her husband passed away in 2006, Brigitte moved to Montana to be closer to one of her adult daughters. She still lives in Montana with her partner, Frank, who encouraged her throughout the memoir-writing process. Anika Hanisch has worked as a freelance writer, ghostwriter, editor, and author coach for over fifteen years. She co-writes both instructional and narrative non-fiction and also coaches fiction authors. Her own writing has appeared in several national and regional magazines including Guideposts and Montana Quarterly.